With the weather not looking that great, the Belknaps seemed like a good alternative to the Whites. Fortunately, the small parking area adjacent to the Carriage Road gate was plowed. 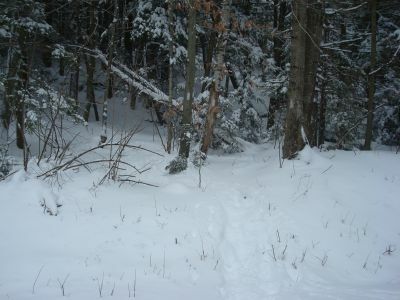 The Gunstock Mountain Trail had been broken out earlier in the day, so the snowshoeing wasn't overly challenging. 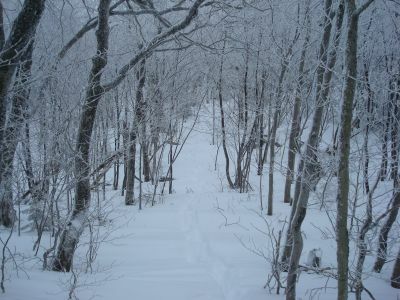 The upper portion of the trail was quite neat, as there was a bit of rime on the trees. 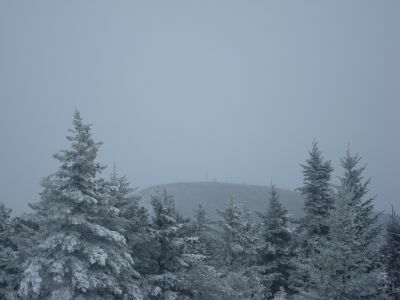 While we saw no one on the trail, the summit area was busy with skiers. Due to the continued light snow, the views were very limited - the only thing visible was Belknap Mountain. 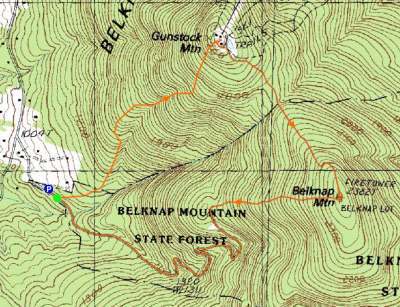 After looking around for a minute for the trailhead to Belknap Mountain, we were soon on our way. 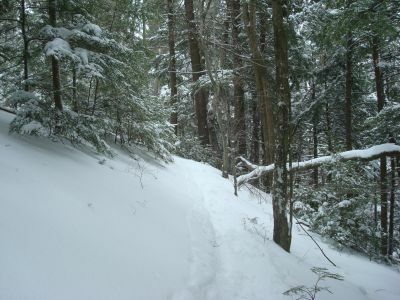 While the Gunstock Mountain Trail hadn't appeared to be hit too hard by the recent ice storm, the Saddle and Blue trails seemed to suffer some damage. Nonetheless, we were able to clear most of the blowdowns and were soon on the summit of Belknap Mountain. 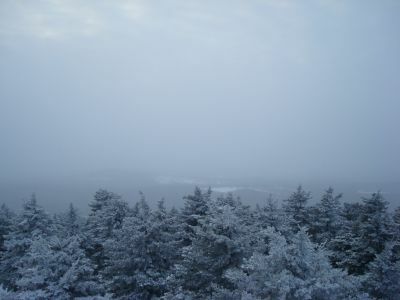 Once again, there wasn't much to see from the summit. 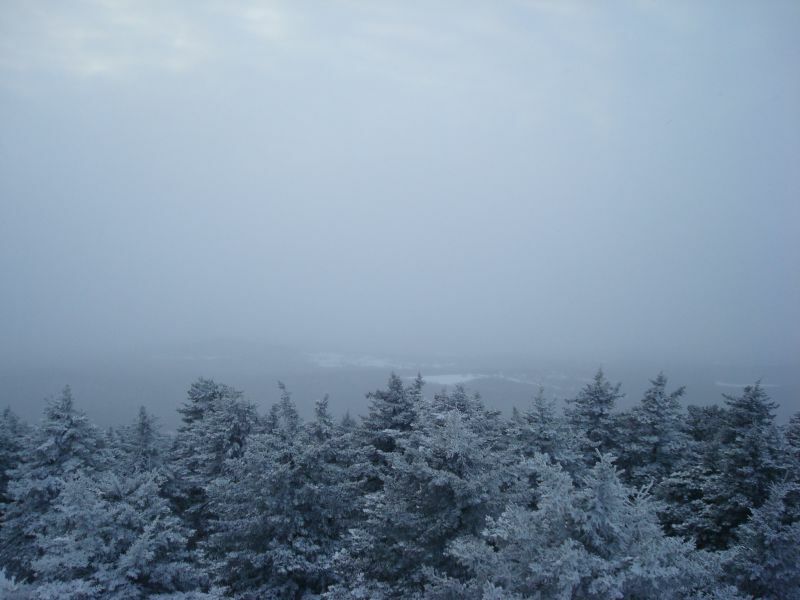 While Gunstock and some fields were visible, not much else was. Though Piper had originally been part of the agenda, it was starting to get dark, so we descended down the Green Trail - the first unbroken section of the hike. Similar to the Saddle and Blue trails, there was some damage that needed to be cleared from the ice storm. Following the Green Trail, we descended down the Carriage Road, arriving at the parking area a little while after the (not visible) sunset. Despite the last of sunlight and views, it was nonetheless another nice hike in the Belknaps.